Hidalgo County Public Affairs Specialist Evana Vleck holds out a microphone for an audience member at a McAllen Citizens League luncheon Thursday, where Hidalgo County Judge Ramon Garcia answered questions about the new county courthouse project. McALLEN — Hidalgo County Judge Ramon Garcia answered a few tough questions about the new county courthouse during a luncheon here Thursday. 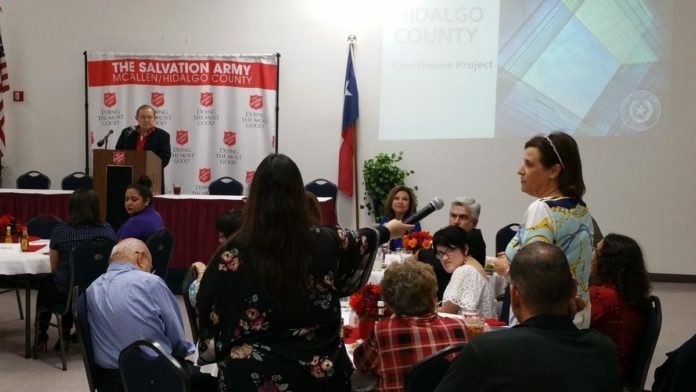 McAllen Citizens League hosted the event at the Salvation Army in McAllen, where about 80 people heard from Garcia over a meal. The event kicked off with an eight-minute video produced by the county that spoke about the need for a new courthouse. It included photos of leaks, mold and evacuations that have occurred throughout the years as the 63-year-old building begins to show its age. The video indicated the existing facility was built in 1954 for a rural community with a population of about 168,000. Today’s population is well over 800,000. The building was also initially built to house five courts. He reiterated concerns about safety and potential health hazards, but also offered new — and differing — information. Perhaps most strikingly, the cost of the courthouse went from a previously stated $141 million to $150 million, as expressed in the video. When asked about it, Garcia said the county had been given different estimates. One of the first had put the cost of the project at over $200 million, but that cost had been reduced significantly after a peer review. One member of the audience asked Garcia why the project had not been put to a vote as a referendum. The county is in the best financial shape in its entire history, Garcia said, reminding the audience the county commission cut the tax rate by one cent just a few days ago. Interest rates are low and are slowly increasing at a rate of four to six percent every year. “Today’s $150 million dollar project will cost up to $171 million if we wait just three years,” the voiceover on the video said. Garcia also reviewed external funding that will help lessen the financial burden on the county. Edinburg is contributing $30 million dollars, while the Hidalgo County Metropolitan Planning Organization is dedicating about $8.5 million in drainage infrastructure to the project out of a $20 million proposed expansion in the area. The county will also restructure its debt. “That’s going to be real key cause a lot of our notes are going to be coming due and are going to be paid for within the next five years,” Garcia said. And once those notes are paid off, that money will go toward the annual payment of the project, which is estimated to be about $10 million per year. Things should look even better in about a decade, when the county begins to receive money from two separate business deals, Garcia said. “Once we get to 2027, we have a littler bit more than $10 million kicking in from some of the agreements we have been entering into with a power plant that is going to be located here in the county and the agreement we entered into with some wind farms,” Garcia said, but did not disclose any further information.